← Delicious Freezer Coleslaw – Keeps for up to a Year. So Tasty Too ! I realize that after a long, bitter winter for many, the last thing you want to think about is planning for Thanksgiving, Christmas, or whatever winter holidays you celebrate. But, let’s face it. Every year for several years, now, I happened to be browsing at one of the national hobby stores here in Albuquerque, toward the end of June. Sure enough, before you could even say “4th of July”, the Christmas decorations, artificial trees and all of the trimmings were being unpacked and the shelves stocked. Memorial Day had just ended, and there were a slew of upcoming holidays on the calendar long in advance of Thanksgiving and Christmas: Take your Dog to Work Day, Sidewalk Egg-Frying Day, Sneak Some Zucchini onto your Neighbour’s Porch Day, National Play Doh Day, Moldy Cheese Day, Clean Your Refrigerator Day and a few others. So why do merchandisers think we want to deal with stuff associated with cold weather, when we’ve just doffed our mittens and overshoes in favour of shorts and sun hats? Beats me, but that’s the way it is. 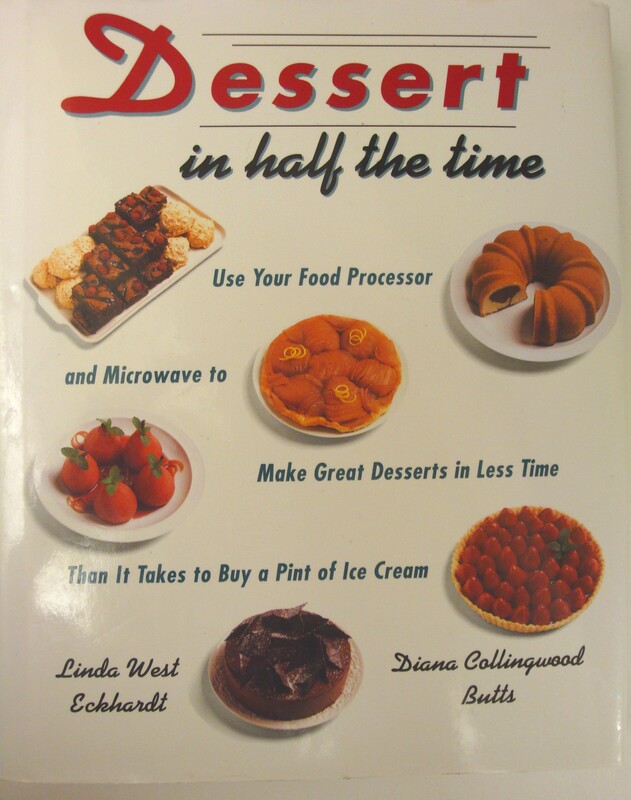 “Dessert in Half the Time” By Linda Eckhardt and Diana Butts. 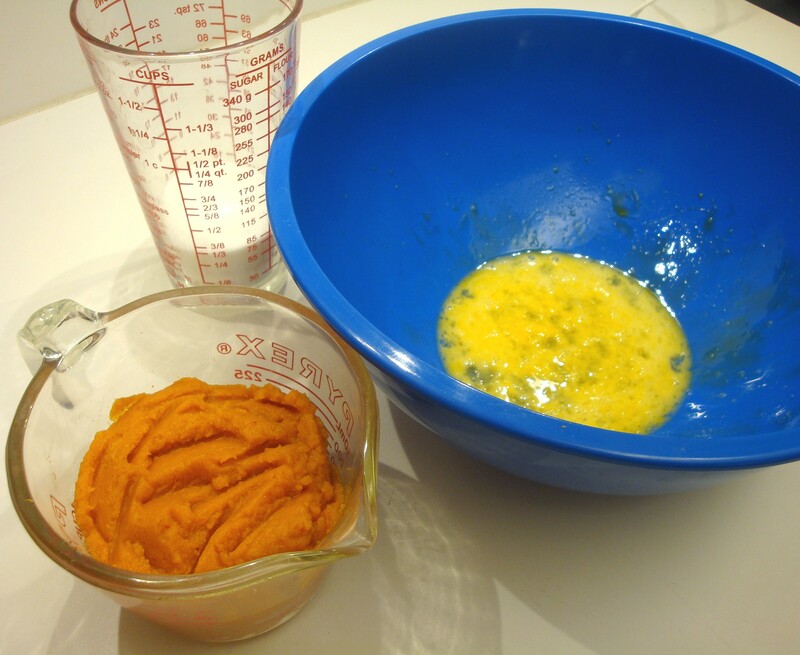 So, in the spirit of pre-planning for fall and winter festivities, I decided to try a recipe from “Dessert in Half the Time” by Linda Eckhardt and Diana Butts, of “micro-rise bread” fame. 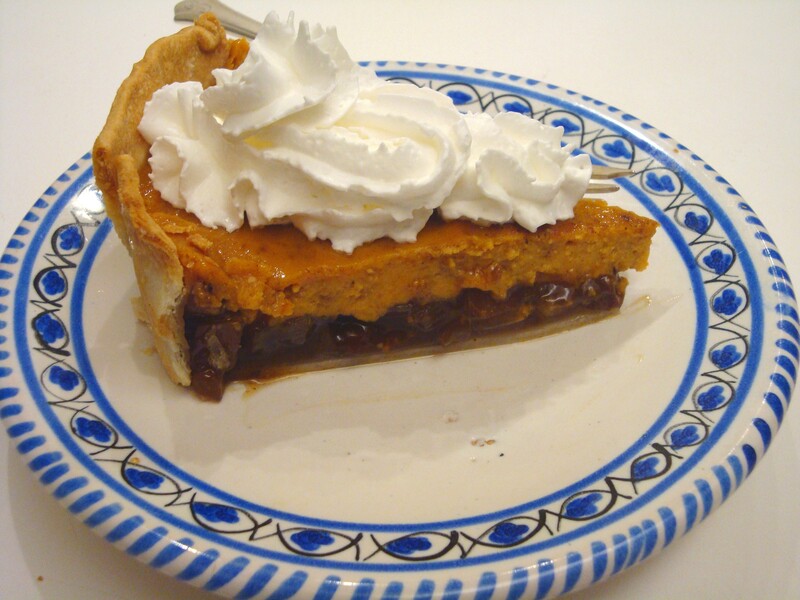 The recipe, “Mincemeat Pumpkin Pie” is a hybrid of the traditional pumpkin pie and for some, the also traditional Christmas mincemeat pie. 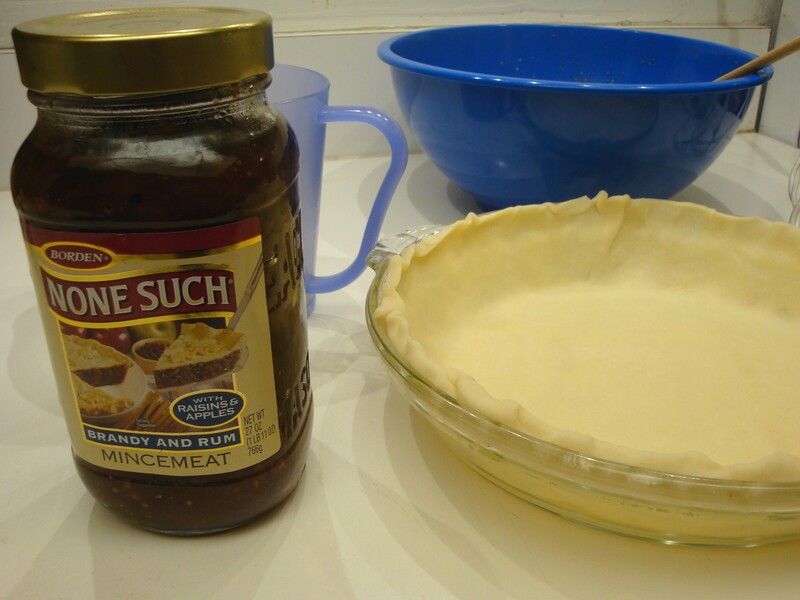 Preheat the oven to 400 degrees F. Fit the pie crust into a 10 inch pie pan, trim and flute the edges as needed. 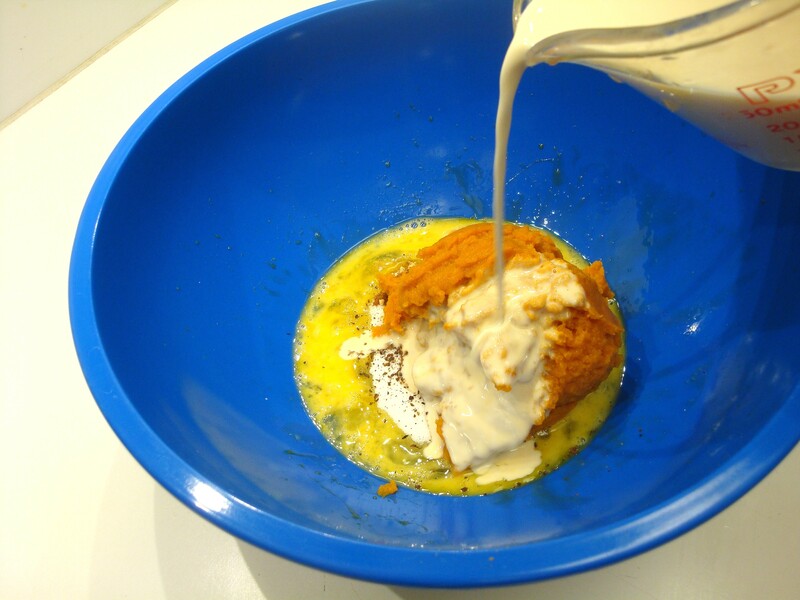 In a medium mixing bowl, combine the pumpkin puree, egg, salt, sugar, pumpkin pie spice and evaporated milk. Blend well. 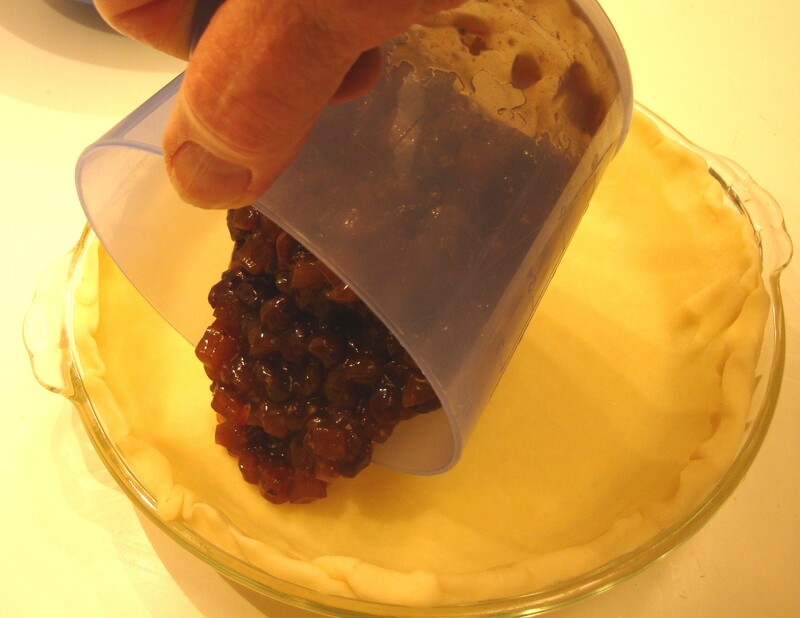 Spread the prepared mincemeat over the bottom of the unbaked pie crust. 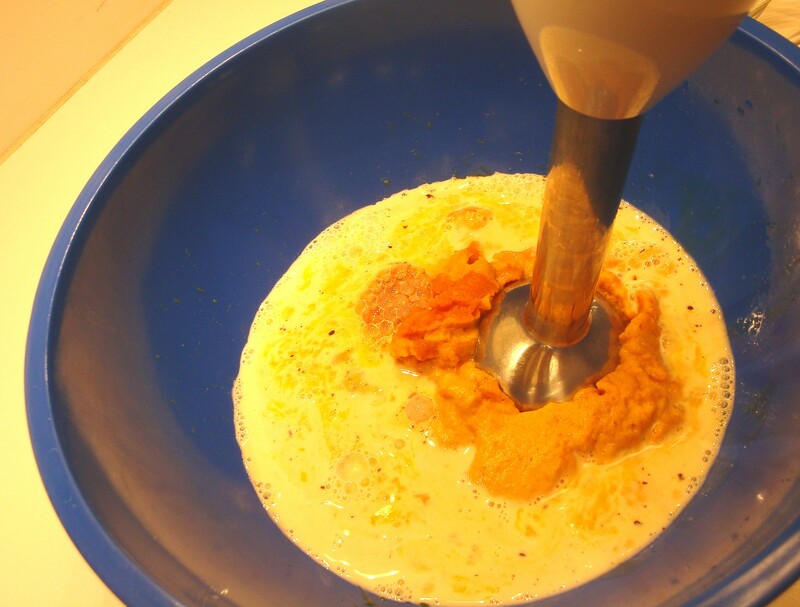 Carefully spoon the pumpkin mixture over the mincemeat layer. 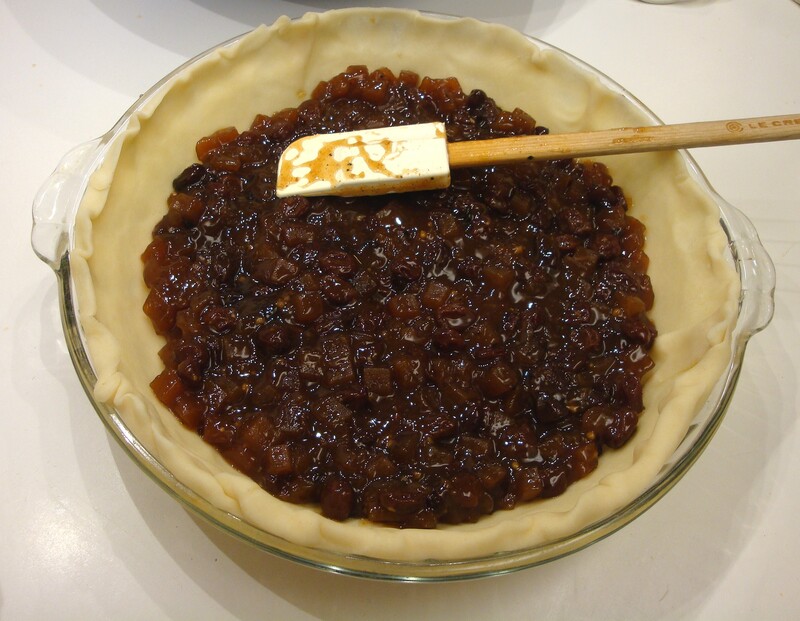 Bake on the middle rack of a preheated oven for 45 to 50 minutes, or until a knife inserted in the middle comes out clean. Cool and serve at room temperature or chilled. 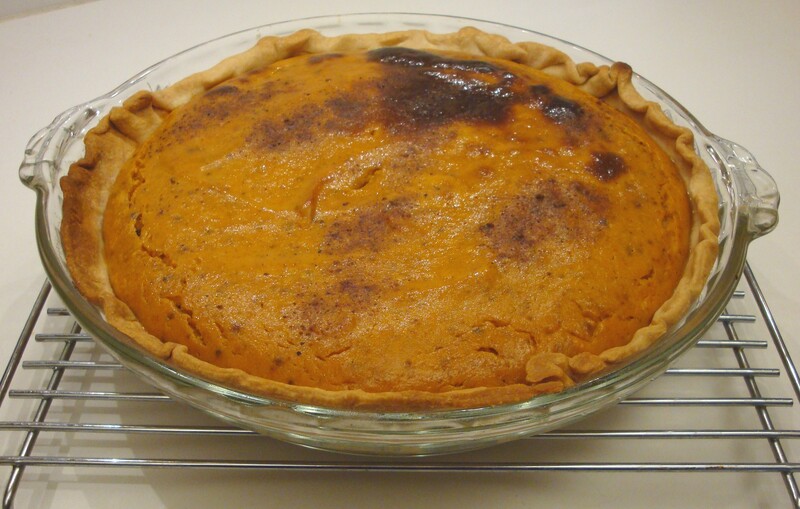 I started my convection oven at 400 degrees F, and baked the pie for 20 minutes. After another 20 minutes, it was becoming a little brown in spots, but not completely “set”, so I turned the oven off and let the residual heat continue to cook it for another 10 minutes, at which time it was done. 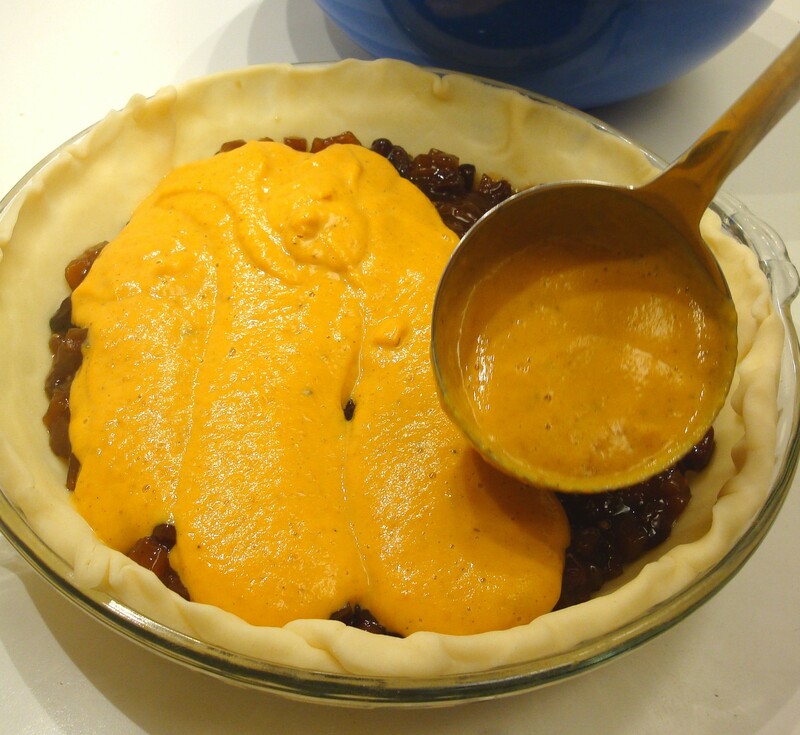 The prepared mincemeat that I used was very sweet, but the pumpkin layer kind of dampened a bit of the sweetness. 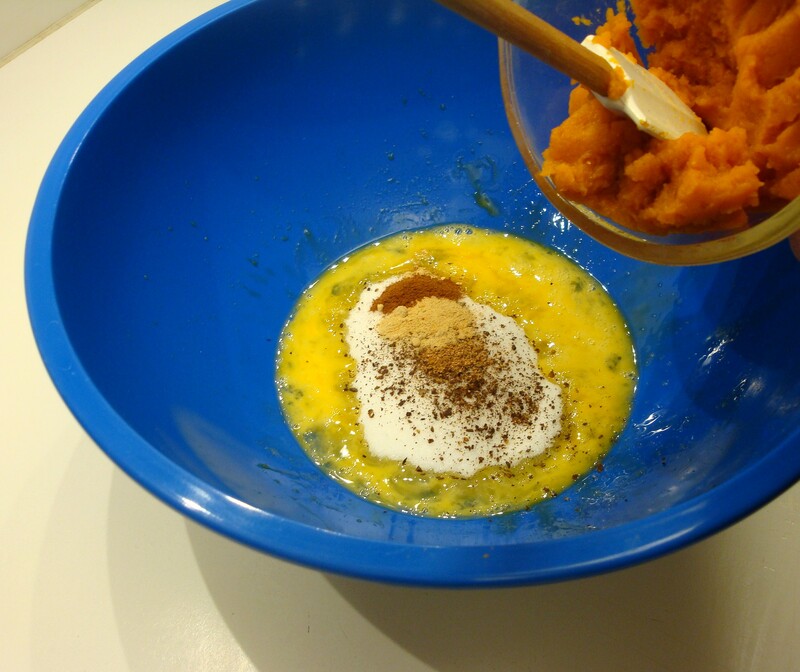 The only adjustment I’d make is to perhaps increase the amount of pumpkin puree. 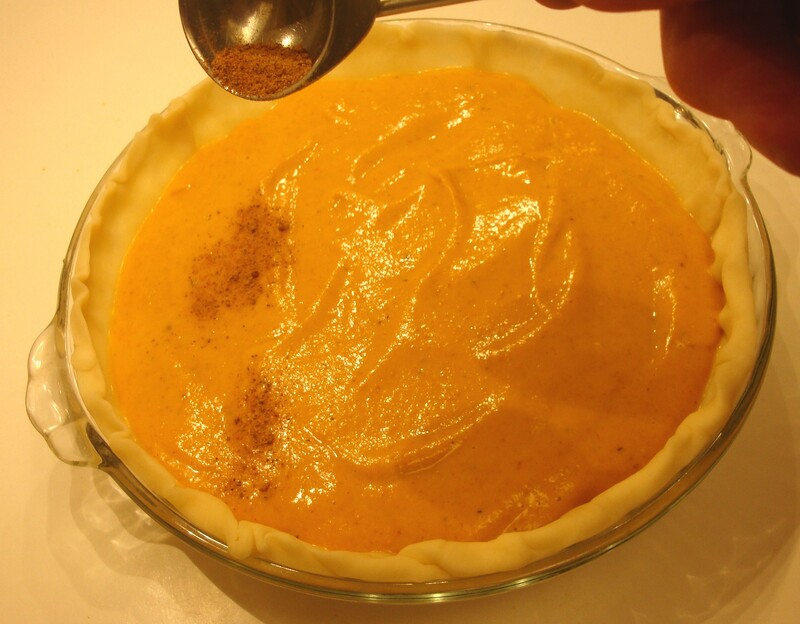 This recipe uses only 1 cup, and after adding the other ingredients to the pumpkin mixture still left a rather large gap between the top of the pie and the top of the crust. I could have easily increased it to 1 and ½ cups and make adjustments accordingly, in order to bring the level up a bit. 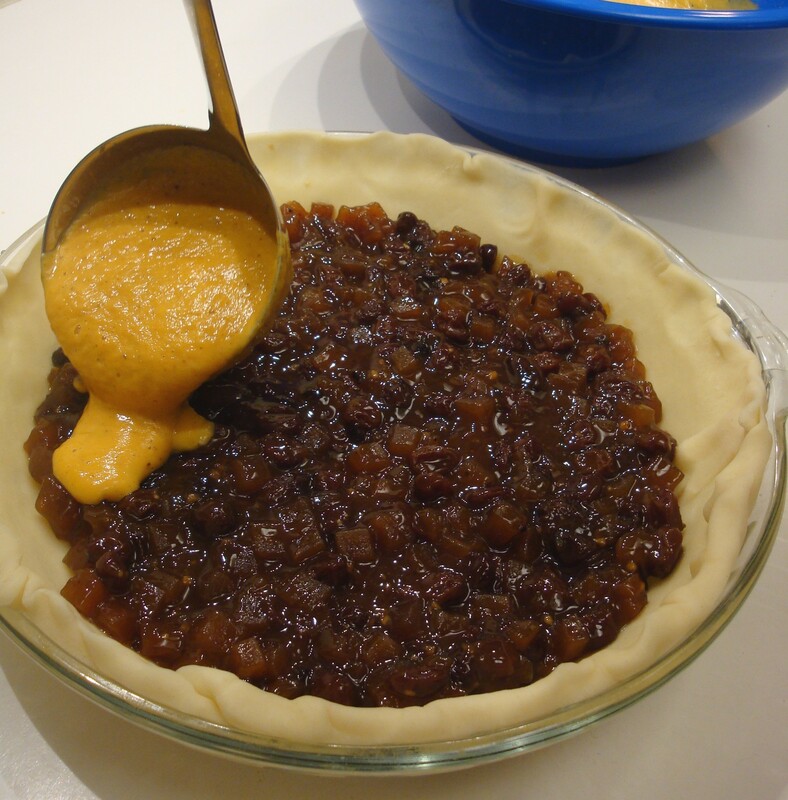 So, if you’re starting to think “Thanksgiving” or “Christmas”, etc, start thinking “Mincemeat Pumpkin Pie”! You’ve got more than enough time to have a few trial runs! Happy Thanksgiving/Merry Christmas or whatever! 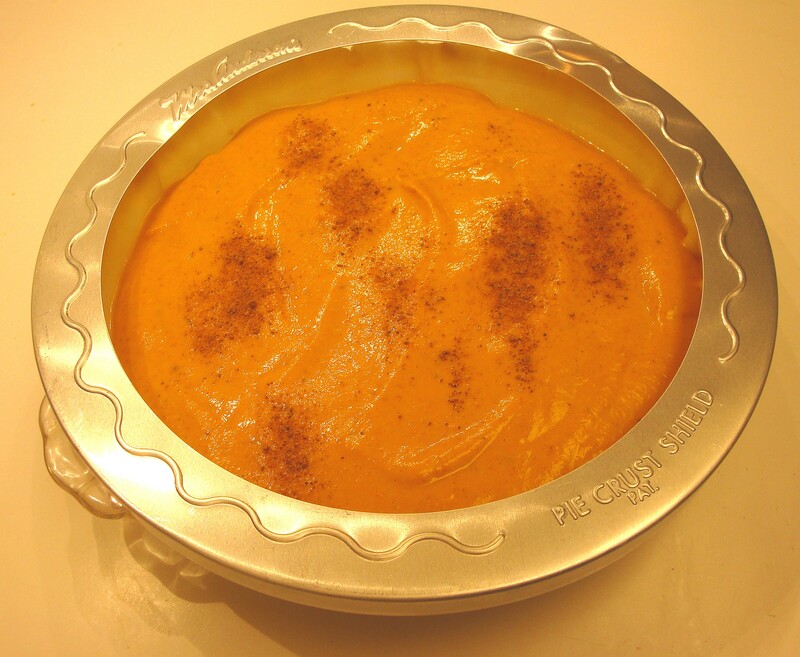 This entry was posted in Comfort Food, Cookbooks, Cooking, Eating, Menu Planning, Recipes, Uncategorized and tagged Albuquerque, Christmas, cookbooks, Cooking, Dessert in Half the Time, Diana Butts, Linda Eckhardt, Micro-Rise, Mincemeat, Pumpkin, Sue Jimenez, Thanksgiving. Bookmark the permalink.